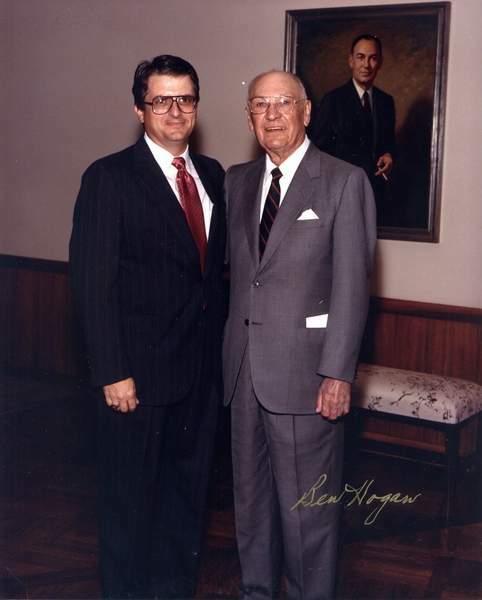 Courtesy photos LEFT: David Hueber, left, author of “In the Rough: The Business Game of Golf,” with Ben Hogan, who is featured prominently in the book. RIGHT: The cover of Hueber’s book, which is available at www.intherough.golf. The cover of “In the Rough: The Business Game of Golf” by David Hueber. David Hueber’s recently published book, "In the Rough: The Business Game of Golf," is something that will appeal to golfers interested in the inner workings of the sport, particularly how it boomed in the last quarter of the 20th century, as seen through the eyes of someone highly influential yet largely unknown. Even laypeople will enjoy Hueber’s storytelling of what some of golf’s biggest names – Ben Hogan, Jack Nicklaus, Greg Norman, Karsten Solheim, Ely Callaway Jr. – were like when the TV cameras weren’t around. But if you’re in northeast Indiana, here’s the kicker: Hueber is a native of Fort Wayne and his book, a mix of autobiography, textbook and humor, speaks about the personalities and issues that have shaped one of this region’s most popular pastimes. "It is a memoir of sorts, but it’s not really about me; it’s about the people I was fortunate enough to work with. There were some famous people in golf, which is important to me because I have a keen interest in the golf industry, as you can tell from the book itself," Hueber, 65, said Tuesday. Signed copies of "In the Rough" are available at www.intherough.golf for $24.95, though the book is available on Amazon, too. The early chapters detail his time as a caddie at Coyote Creek Golf Club, which was then the Elks Country Club, and his relationships with some of the area’s great players, such as Bill Kratzert, Tom Kelley and Bill Schumaker. The son of a well-known local golf pro, Hueber in his book doesn’t belabor his own successes and failings as a promising local golfer in the shadows of the aforementioned local icons before getting to the nitty-gritty: his time in marketing for the PGA Tour, when it was directed by Deane Beman and became the megasport that it is today; his time as president and CEO of the National Golf Foundation; and the move to become president and CEO of the Ben Hogan Co.
"It is kind of like my Forrest Gump, soldiering through the game and the golf business because it did involve a lot of things from professional golf to golf course development to business and the leading characters in both the game and the golf industry," Hueber said. Now with a doctorate from Clemson University, he is a consultant residing in Ponte Vedra Beach, Florida, an expert in how the number of golf courses exceeded the demand, how the market is still trying to correct itself, and the challenges of design and price points. The very issues that have affected ­courses here – such as Deer Track eliminating nine holes to develop the land or Sycamore Hills renovating to modernize and become more tournament-friendly – are things that Hueber speaks passionately about. "We’re going through a period now since 2006 where the golf industry is having a net loss of about 140 golf courses per year," he said. "How that’s determined is there are about 160 golf courses closing each year and about 10 or 15 opening. My focus and attention is ‘How do we survive this?’ And we’ve had a downturn in participation as well." The challenges that face golf come out in the book. "The play of golf changed from a game of shot making and skill, requiring what Ben Hogan described as ‘course management,’ into clearly what has become a power game," Hueber writes. But "In the Rough" more than anything is really a look at interesting people, the decisions they made and how they affected what we golfers do, pay for and see on TV. One such character is Minoru Isutani, a Japanese entrepreneur who lost $350 million on the purchase and sale of Pebble Beach. Hueber, who has a number of golf patents, including several involving the invention of hybrid woods, never envisioned he’d get to all he did. "I grew up in a very modest situation and environment and go to do so many things I’d never dreamed of doing," he said.